Beer & Brew invite you to a series of exciting events. See below for details and make sure you come along. Beer & Brew – experts in the field with years of experience – help choose the second hand car to suit you. We teach the best way to kick tyres and look blindly at an engine compartment. We can tell you if a headlight and grille arrangement makes a car look smug or surprised. Join breakout groups on important topics such as Ooh, That’s A Nice Colour and Does It Smell Of Dog In Here? Spot mammals (furry), birds (wings) and amphibians (squelchy if stood on) as you join Beer & Brew – experts in the field with years of experience – on a guided walk around places we’ve sometimes seen some animals. We’ll demonstrate how to walk quietly so you don’t scare things away and how to identify what you find – it’s probably a big hamster. FREE illustrated book featuring all the cats we know locally and the limpy fox from the corner. We don’t really know what we’re doing when it comes to Bridget Jones or badger spotting, but that won’t stop us running these events. We’ll blag our way through, speaking as if we know what we’re talking about. We’ve read a small booklet on identifying garden birds that we got free in the paper, we read Eat Pray Love, and we stole a copy of What Car? from where we had our MOT done. That’s all you need really. You might think this doesn’t constitute the appropriate level of expertise. You may even say that a bad experience on the romantic fiction session might taint your view of a genre you previously enjoyed, and if others with little or no genuine insight ran courses too it could even do the industry harm in the longer term. We don’t care about these things, as long as you sign up we’re happy. If you wanted to do…I don’t know, let’s say a beer and food pairing evening, you might want the person leading it to have trained, researched and explored the subject. You might like them to have extensive knowledge of beer styles and qualifications to prove it. In your mind they may have their own tried and tested examples amassed over many years including enduring pairings for duck, smoked fish, or mushrooms. Or you might just expect a keen barperson to tell you that light IPAs work with lighter dishes while richer IPAs work with richer dishes. If this last example is what you’re after, you’re in luck. If you like Pulled Pork Tacos or Bourbon Chicken Wings then there’s someone to tell you which Lagunitas or Northern Monk you need to order. And cheese? Well any beer works with any cheese because both are tasty. Such knowledge. Don’t choose Beer & Brew to pick you a second hand car just because we’ve owned three of them. Don’t expect us to host a decent nature tour because we watch Springwatch. 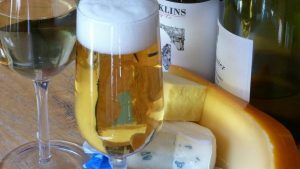 Choose beer sommeliers to run beer and food pairing events. That’s what we do.